But with Lion’s version of the application (no. 6), I fear that, under the influence of the corresponding iOS app (called “Contacts”), Apple has taken a big step back in usability, and I’d like to explain why here. When you think about it for two seconds, it’s obvious: in a real address book in which you write down your contacts by hand, the very concept of a group does not exist. The best organizational tool you get is the alphabetical order. You cannot organize your entries in groups. The very concept of groups is one of the key benefits of having a computerized address book in the first place! With an electronic address book, you can organize your contacts not just by alphabetical order, but also based on specific categories. In an age of ever-expanding social networks, this is an essential feature if you want to try and be somewhat organized in your work or in your life. In addition, when you are viewing the column with the groups on the left, as in the first picture above, the currently selected group is barely visible. The only sign that it is selected is that the name of the group is in blue instead of being in black. Where else in the Mac OS X user interface is text colour a form of selection highlighting? The nearly universal way of highlighting a selection is to change its background colour. (To highlight the selected card or cards, Address Book 6 changes not just the text colour, but also the background colour, to a light shade of blue. But it does not do that for groups.) And there is no icon next to the group’s name to indicate that it is a group instead of a card. Visually speaking, it’s almost as if groups no longer existed. It’s as if Apple was really trying to discourage us from using them at all. What justification can there be for deprecating the Groups feature like this? Sure, I know that many computer users don’t even bother to maintain a proper address book at all and just rely on their software’s automatic memory of previously-used recipients (such as the “Previous Recipients” feature in Mail). But is that really an excuse? Did Apple really have to make the Groups feature in Address Book more difficult to use because of this? What is gained by removing groups from view? Simplicity? Obviously, if this many computer users don’t bother to maintain an address book at all, it is because even a simpler user interface is still too complicated for them. I’d very much like to see the scientific studies of Mac users Apple has conducted that prove that a “simpler” user interface like the one in Lion actually makes the address book more useful and more likely to be used. I would also very much like to know how Apple’s engineers can rationalize the fact that, when you are looking at the Address Book application with the groups on the left and the list of contacts on the right, there is no button to create a new contact. As I’ve written before, I find this completely mind-boggling. In this view, the only way to add a contact to the currently selected group is either the “New Card” command in the “File” menu or its keyboard shortcut. Why on earth is there a “+” button in the bottom-left corner for creating a new group and not one on the right for creating a new contact? How often does the average user create a new group compared to how often he creates a new contact? Please let us know if the problem you reported below is fixed or not in the latest version of the software available to you. Also, You can use the File > New Card menu item, or its Cmd-N shortcut. Needless to say, the latest version of OS X that they were referring to did not contain any improvements, and the “New Card” menu item and the command-N shortcut remain the two only ways to create a new contact. Sometimes I feel like I am talking to a wall. 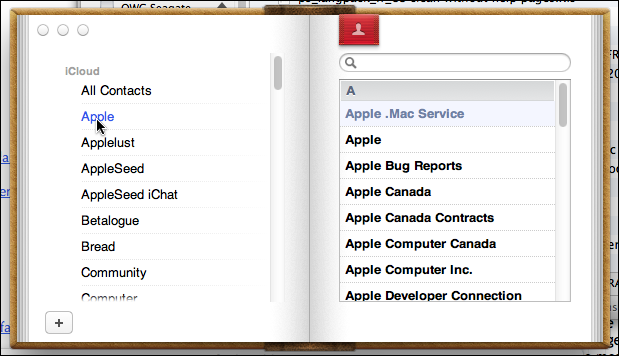 There are other problems with the new Address Book interface in Lion. As with previous versions of Address Book, if a specific group is currently selected, the “Find” function only searches for matches within that group. If you want to search for matches in all your contacts, you have to remember to first go back to the list of groups and select “All Contacts.” It was already like that in previous versions, but now with the two-column view, it requires even more mouse clicks. As far as I can tell, there is no shortcut for automatically selecting all contacts before starting a search. With previous versions of Address Book, I had written a Keyboard Maestro macro to automatically select all contacts before selecting the search field. Of course, with Lion’s Address Book, I was forced to rewrite my macro. I managed to do so, but even with my rewrite, the skeuomorphic Address Book UI is significantly more sluggish now, which means that there is a very noticeable delay when I trigger the macro before I can actually start my search. I am not even talking here about the absurdity of this skeuomorphic UI in the first place. Think about it: when is the last time you had in your hands a “real” address book where there was a list of groups on the left and a list of contacts on the right and when flipping a page actually switched the contents of the right page to the next left page and showed the contact details on the right? Last time I checked, a handwritten address book consisted of plain pages with stuff written on them, and flipping pages just took me from one item to the next. And if the idea is to imitate some kind of “index” or “table of contents” page, then tell me, do you really know of any book readers who have never wished that they could look at both the index or table of contents and the actual contents of the book at the same time? It’s so obvious that this is an improvement! Yet, that’s exactly what Apple has taken away from us with this “new and revamped” user interface. But at least, it has, you know, a three-pane view mode that lets you view groups, their contents, and card details all at the same time! And there is a “+” button for adding a new contact no matter what you are currently looking at! 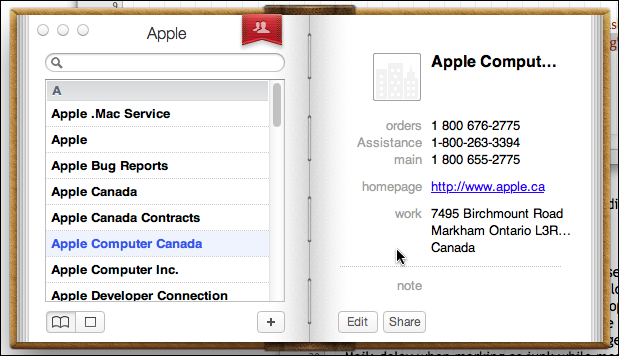 Contactizer Pro uses the same contact database as Address Book, so any change to your contacts is immediately reflected in any application that uses that database, such as Mac OS X’s Mail. The whole situation reeks of arrogance. Apple’s engineers make assumptions about the ways in which we use their software, and apparently feel no qualms about deprecating some important features or making them more difficult to use in the name of “simplicity” and “user-friendliness.” I don’t know about you, but to me there is absolutely nothing user-friendly about this new skeuomorphic user interface and, once again, it makes me fear the worst about Apple gradually dumbing down the Mac OS X environment to make it more like iOS and less like a user environment that real people actually try to do real work with. This entry was posted by Pierre Igot on Sunday, January 15th, 2012 at 4:45 pm	and is filed under Macintosh. You can follow any responses to this entry through the RSS 2.0 feed. Responses are currently closed, but you can trackback from your own site.